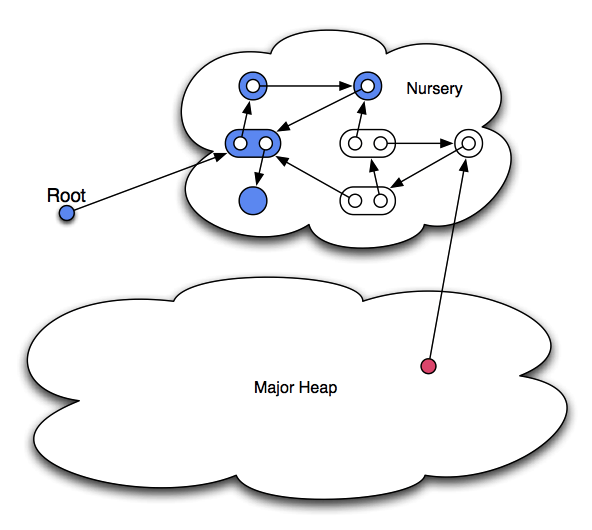 In previous installments of my blog post series on SGen, Mono’s generational garbage collector, I wrote about the major and minor heaps and their organizations. What I have for the most part neglected to pontificate on is how they interact with each other. Let’s say we collect the nursery, starting from the single root reference. We find a graph of four live objects, colored blue, and promote them to the major heap, discarding all the others, including the three white ones. But wait—there’s a reference in some object on the major heap pointing to one of the objects we have just destroyed! This cannot stand. Where did this reference come from? Consider the previous nursery collection. We’ll ignore pinning for now, so after that collection the nursery was empty. The mutator (that’s what garbage collector people affectionately call the pesky thing that insists on messing with the heap and that most people refer to as the program) allocated that white object, and stored a reference to it in an object on the major heap—in that order, but not necessarily in direct succession. One way to handle those references is to scan the whole major heap for them and to treat them as roots. That would make nursery collections as slow as major collections, so it’s not a good idea. What’s needed is a way to record all such references happening between nursery collections. The nursery collector would then process them like ordinary roots and everything would be in order again. Write barriers do exactly that: On every store of a reference in an object they check whether the reference resides in the major heap and points to the nursery. If those conditions are satisfied, the reference is recorded for the benefit of the next nursery collection. This sounds like an awful overhead for each store, but it really isn’t, and for almost all applications it’s far outweighed by the advantages from generational collection. A note on terminology: The literature sometimes uses “write barrier” to refer to just the code that identifies references to remember, and sometimes to refer to both the code that identifies as well as records those references. I shall be using the term in the latter sense. SGen’s write barrier is a so-called card table. We also implement an alternative, a sequential store buffer, which I will not discuss here. The basic idea is to conceptually divide the major heap into small, equally sized regions, called cards, and to have one bit per card that is set—the card is marked—when a reference to a nursery object is written to it. The advantages of this scheme are that it requires only a handful of instructions to record a store, so it can be inlined, and that its space overhead is small and proportional to the heap size. The disadvantage is that it doesn’t record the exact locations of the references we’re interested in. In SGen’s case, cards are 512 bytes large, so the nursery collector needs to scan roughly that amount of memory to potentially locate a single reference. The references it does find it treats like ordinary roots: the referenced objects are promoted to the major heap and the references are updated to reflect their new locations. The newly promoted objects are then scanned in turn, of course. Once all marked cards have been scanned there are no more references from the major heap to the nursery, so all cards mark bits are cleared, to be ready for the next round. So far we have been assuming that when we encounter a reference from the major heap to the nursery, we can always move the nursery object to the major heap, thereby rendering the bothersome reference harmless. As I explained in the blog post on the nursery, sometimes objects become pinned, which implies that they cannot be moved. This threatens to confound our cunning plan: we can only clear the card mark bits because there are no references left that we need to keep track of. The solution here is simple: Cards containing references to pinned objects must stay marked so that they will be processed again during the next nursery collection, in the hopes that the object referred to will no longer be pinned. This can lead to another potential problem: Assume that some nursery object remains pinned, and that there are lots of objects in the major heap that refer to it. Lots of cards would remain perpetually marked and nursery collections would become dominated by card scanning. That is in fact what we noticed on two benchmarks in our small GC benchmark suite—nursery collections took much longer than expected and the programs took twice as long or more to run with SGen than with Boehm. I just implemented a new feature—not yet pushed to master—that solves this new problem in a very simple way. I call it “cementing”, because it institutionalizes bothersome pinned objects: if we encounter a certain number of references from the major heap to a particular pinned nursery object, we just give up on it. Instead of hoping that it will become unpinned soon, we cement it—the punishment for badly behaved pinned objects. A cemented object will always be pinned at the start of future nursery collections as a matter of principle. The consequences of this are that it will be treated as a root, and that it will not be moved, which in turn means that we don’t have to worry about references to it from the major heap any more: the object is kept alive and the references can stay the same. Cards with references to cemented objects can be cleared, reducing the card scanning load. Major collections give us a blank slate because we need to scan all live major heap objects anyway, so we use them as opportunities to reset cementing, giving those poor objects another chance after all. The red bars represent the wall clock run time with Boehm. 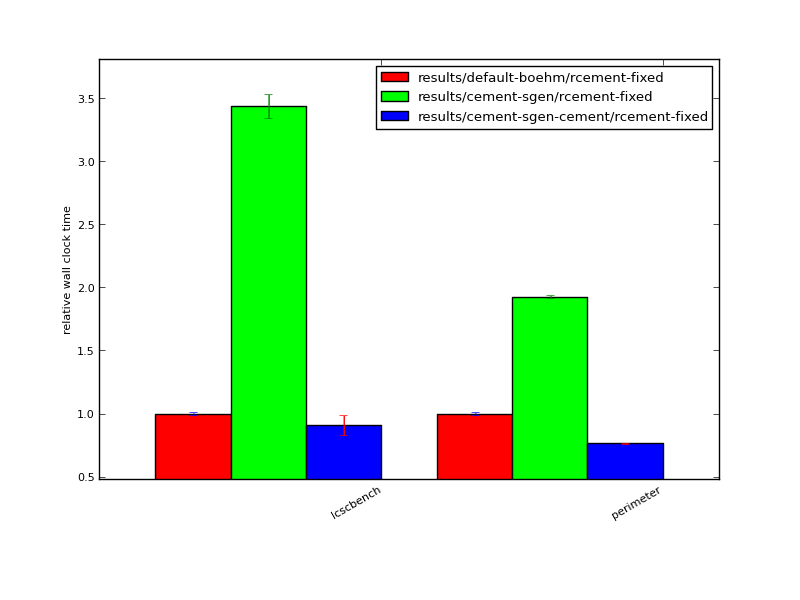 The green bars are SGen run times without cementing, and blue are SGen with cementing. So it sounds like you are basically promoting the pinned object’s generation while allowing it to stay in the nursery region? How do you track/count the number of references to these pinned objects (just curious)? * If there are no references to it, it will be ignored and removed at the end of the collection. * If there are only precise references to it, it will be promoted to the major heap. * If there is at least one imprecise (conservative) reference to it, it will be pinned and remains in the nursery, at least until the next collection. Does that answer your first question? I’m assuming your second question is about the references that actually pin those objects, i.e., the conservative ones? When we conservatively scan a memory region – a thread stack, say – we examine each potential pointer to see whether it points into the heap. If it does, we put it into the “pin queue”. In idealized terms, you can think of the pin queue as just a dynamically growing array. Once we are finished scanning, we sort the pin queue and remove the duplicates. Now we have a sorted, uniqued list of potential pointers into the heap. We walk each heap region, going through this list, and marking each object pinned (as well as putting it in the gray queue) that’s pointed to by an entry in the pin queue. How many references to a particular object there are or where they come from is irrelevant. We have a new nursery collector, split-nursery, which keeps objects around in the nursery a bit longer, in a small, semi-separate aging space. This is to give them a bit more time to potentially die, which will save major heap space and expedite finalizations.